The Makita 2 piece DLX2221BT2 kit features two powerful Black 18v Brushless motor machines: the DHP483 combi drill and the DTD155 impact driver. Both machines are the same compact size as the equivalent 10.8v models and packed with power and advanced operating features. The DTD155 LXT impact driver with Brushless motor and ¼” hex drive will drive home M8 machine screws; M12 high strength bolts and 90mm coarse thread screws. In Hi-mode this powerful impact driver will run up to 3,000rpm; deliver 3,900 impacts per minute and generate 140Nm of torque. In Lo-mode the DTD155 impact driver delivers 1,300rpm and 1,600ipm. It also features the Assist mode for greater machine control; initially driving at low speed which allows the fixing to start, before full power drives the fixing home. The DHP483 Brushless motor combi drill has a body length of just 176mm. This 13mm 2-speed combi will deliver 25,500 impacts per minute in Hi-mode, 7,500ipm in Lo-mode, and 40Nm of torque with 20 drive settings plus drilling mode. 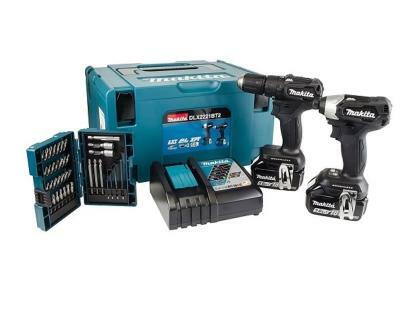 This powerful Makita 2 piece 18v kit is supplied with two 5.0Ah Lithium-ion batteries and a DC18RC fast charger, a 38 piece Bit Set and is packed in a Makpac Type 3 hard shell case.